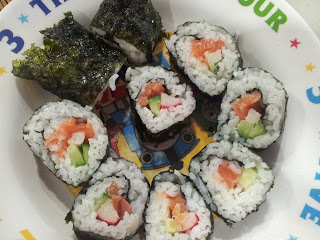 Sushi has been enjoyed with my children ever since my 4 year old daughter saw her cousin eat it. Yes, kids are rather impressionable. 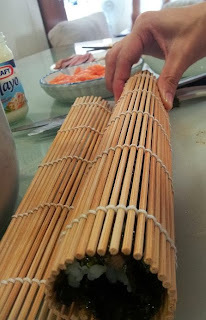 Anyway, sushi making is really fun to do it together as a family and it encourages creativity as well! 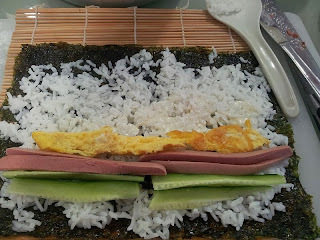 It is also very easy to prepare and the best thing is that the leftovers can be PERFECT for fried rice! So, very minimal wastage! 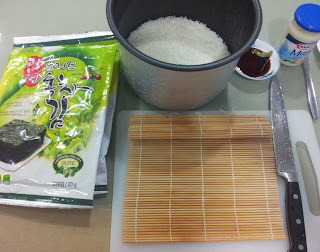 Many recipes state to put vinegar inside the rice. But I found that it is not necessary if you just want to keep it simple! 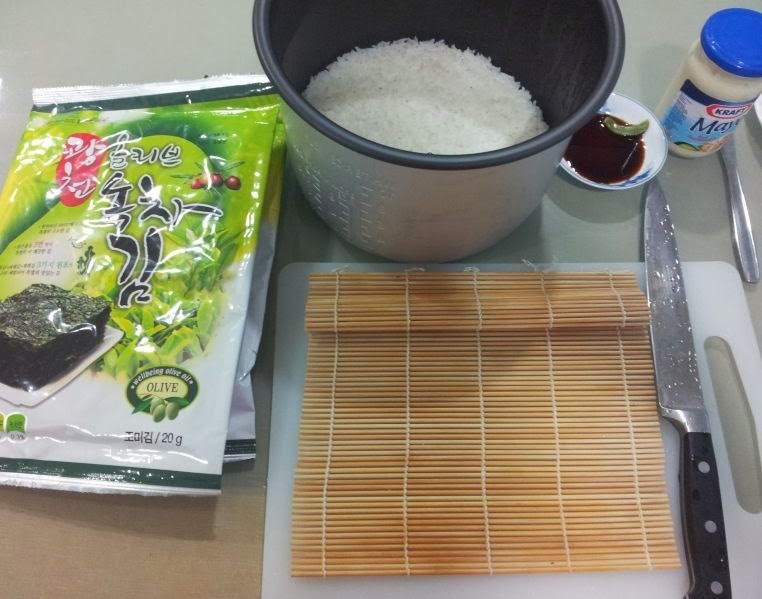 1) Cook the rice way in advance. If you are having it for lunch, cook it in the morning to allow it time to cool down. 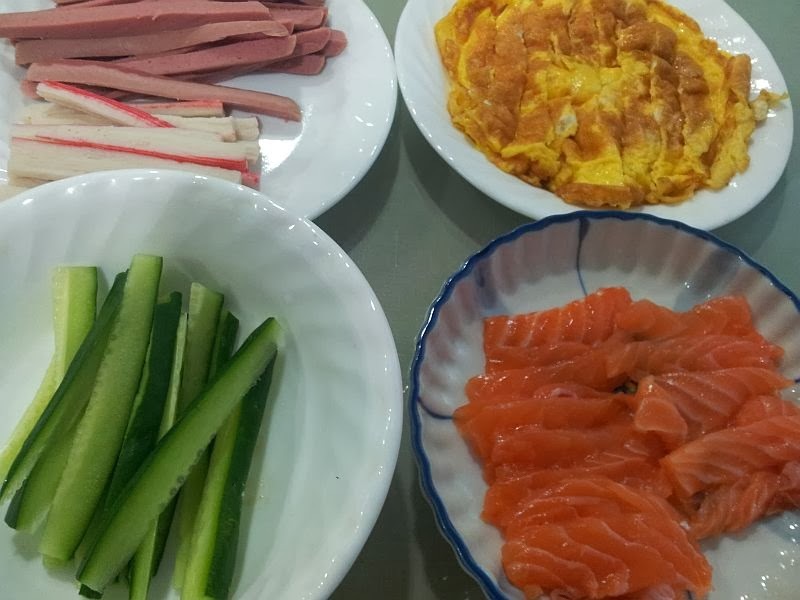 I just cooked it normally in the rice cooker as how I would cook my usual rice. 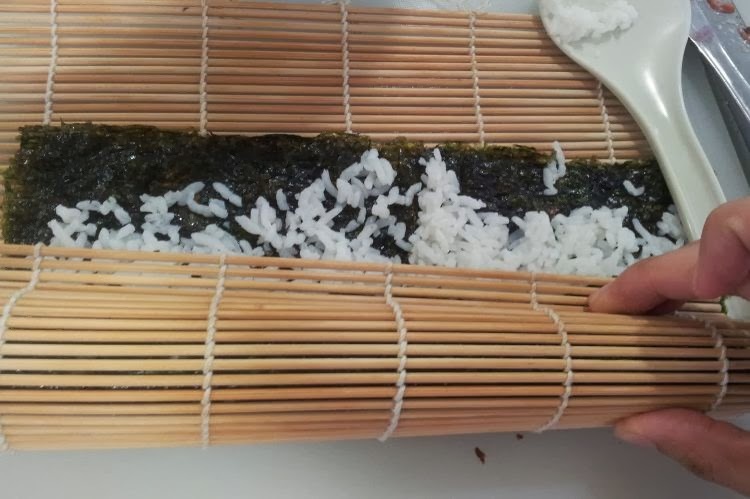 Except that I would add more rice than usual as sushi making does take up more rice. So I would add about 1/2 cup to 1 cup more than usual. 2) Cook the sausage in whatever method you want. I opt for boiling in a pot of boiling water as it is 'healthier' and easier to wash after that. 3) After that, thinly cut the sausages in strips. 4) Thinly slice the cucumber as well. 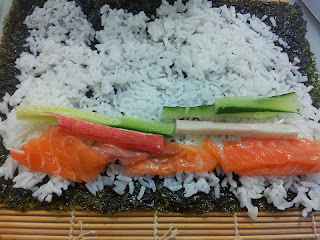 If you are using Japanese cucumber which I normally use, I would retain the skin. But otherwise, remove the skin. 5) Beat the eggs and fry them in a pan of hot oil. Then remove from pan and cut it thinly as well. 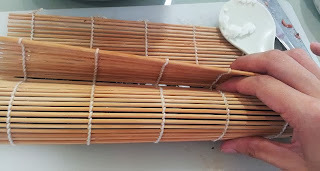 6) For the crabsticks, I did not cook them. 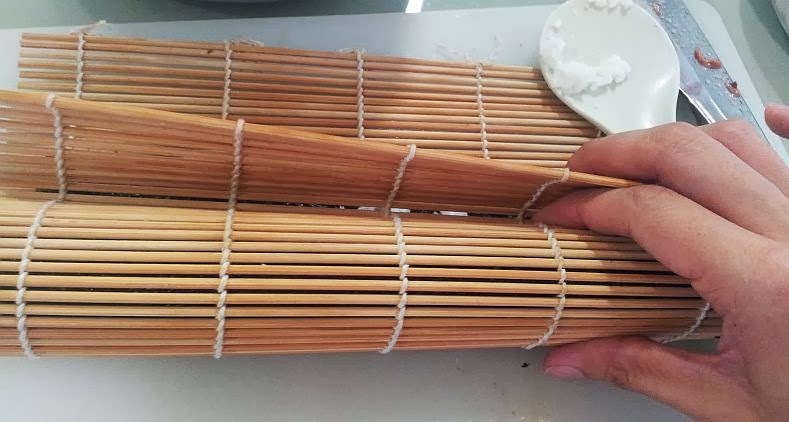 I just thaw it, remove the plastic and thinly strip it as well. 1) Lay the nori sheet on top of the bamboo roller. 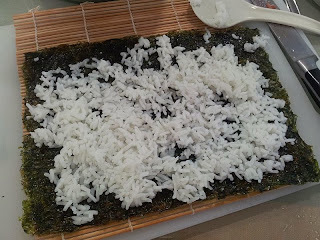 Then scoop rice on the seaweed by pressing it down and spreading it. Most places make sure that there is rice on every part of the seaweed. So it is really compact and compressed. However, I didn't want to fill to full..so I opted for less rice. So there are gaps in between. 2) Place whatever ingredients you want to put in your sushi. My girl likes sausage and eggs. So here's how I put it. 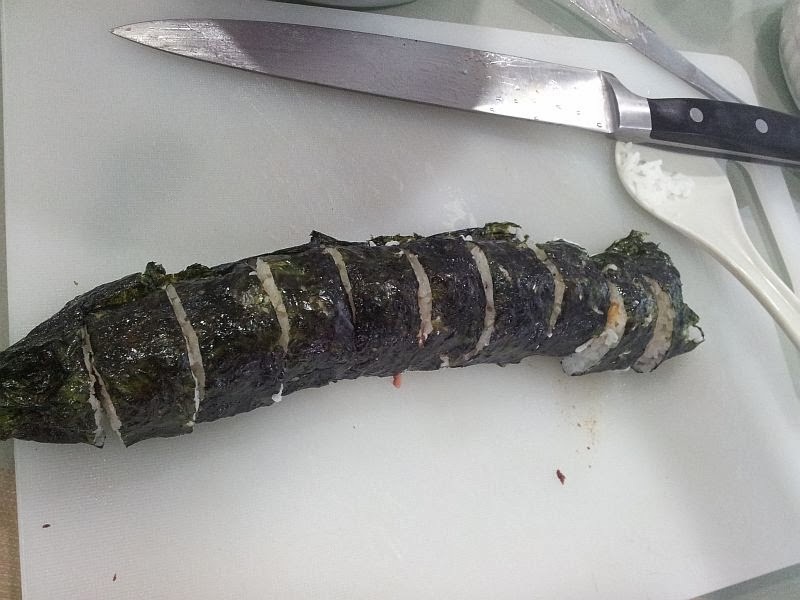 Place them only in the front portion of your seaweed. 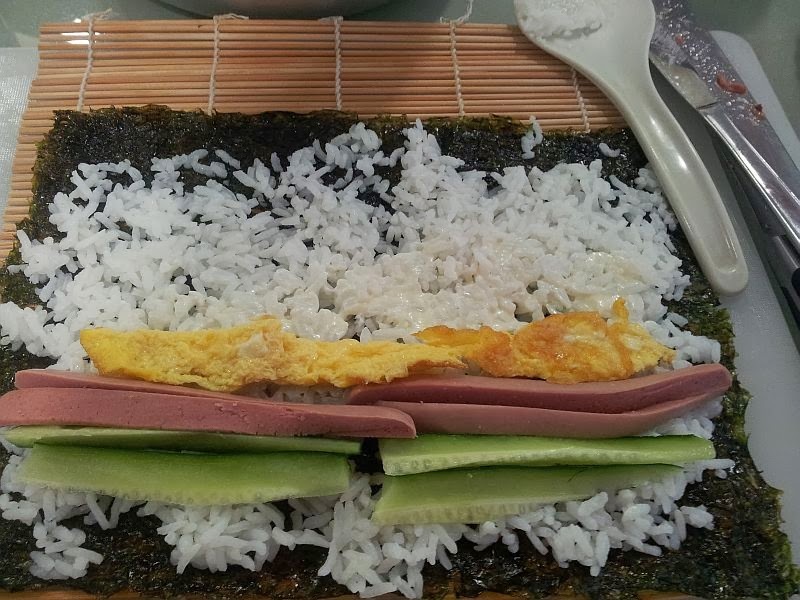 I also spread mayonnaise on the rice first. 7) Next, you take a sharp knife to cut. When cutting, please take note NOT to press your knife down. You just slice gently, allowing the knife to do its work. If not, your sushi will end up in a mess. Enjoy and have fun! 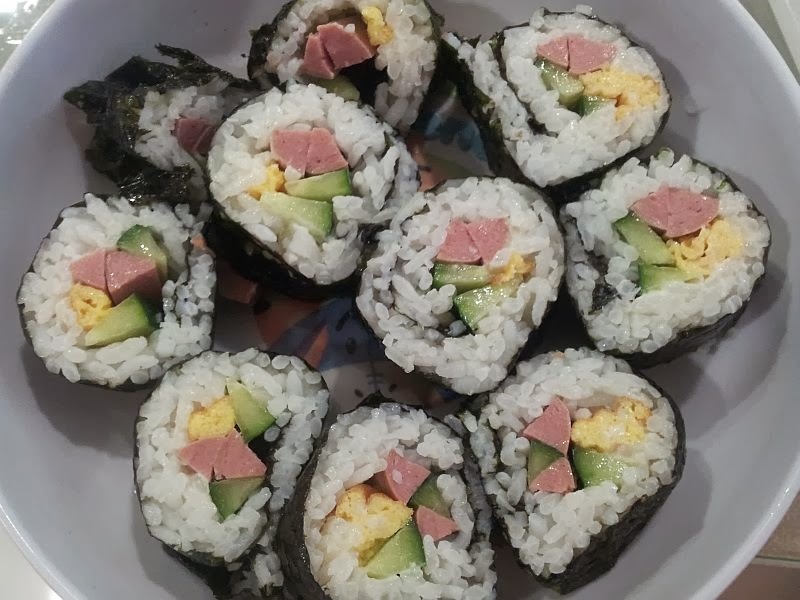 I had leftovers for my sushi. So I used them for dinner as I cooked my children's another favourite- fried rice! Here's my fried rice recipe !